N.A. Krueger, A.L. Holsteen, S.-K. Kang, C.R. Ocier, W. Zhou, G. Mensing, J.A. Rogers, M.L. Brongersma and P.V. Braun, "Porous Silicon Gradient Refractive Index Micro-Optics," Nano Letters 16, 7402?7407 (2016). S.I. Park, G. Shin, J.G. McCall, R. Al-Hasani, A. Norris, L. Xia, D.S. Brenner, K.N. Noh, S.Y. Bang, D.L. Bhatti, K.-I. Jang, S.-K. Kang, A.D. Mickle, G. Dussor, T.J. Price, R.W. Gereau IV, M.R. Bruchas and J.A. Rogers, "Stretchable Multichannel Antennas in Soft Wireless Optoelectronic Implants for Optogenetics," Proceedings of the National Academy of Sciences USA 113(50), E8169-E8177 (2016). K.-T. Lee, Y. Yao, J. He, B. Fisher, X. Sheng, M. Lumb, L. Xu, M.A. Anderson, D. Scheiman, S. Han, Y. Kang, A. Gumus, R.R. Bahabry, J.W. Lee, U. Paik, N.D. Bronstein, A.P. Alivisatos, M. Meitl, S. Burroughs, M.M. Hussain, J.C. Lee, R.G. Nuzzo and J.A. Rogers, "Concentrator Photovoltaic Module Architectures with Capabilities for Capture and Conversion of Full Global Solar Radiation," Proceedings of the National Academy of Sciences USA 113(51), E8210-E8218 (2016). A. Koh, D. Kang, Y. Xue, S. Lee, R.M. Pielak, J. Kim, T. Hwang, S. Min, A. Banks, P. Bastien, M.C. Manco, L. Wang, K.R. Ammann, K.-I. Jang, P. Won, S. Han, R. Ghaffari, U. Paik, M.J. Slepian, G. Balooch, Y. Huang, J.A. 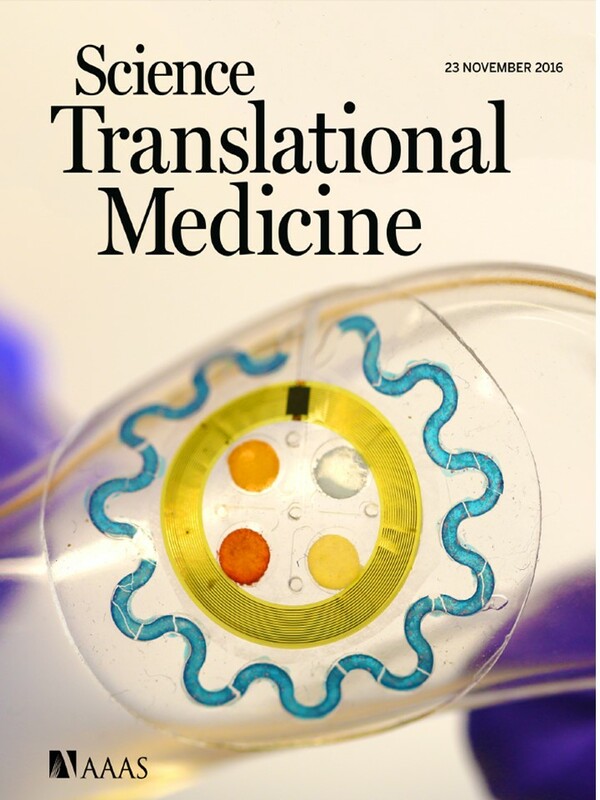 Rogers, "A Soft, Wearable Microfluidic Device for the Capture, Storage, and Colorimetric Sensing of Sweat," Science Translational Medicine 8, 366ra165 (2016). Y. Liu, J.S. Norton, R. Qazi, Z. Zou, K.R. Ammann, H. Liu, L. Yan, P.L. Tran, K.-I. Jang, J.W. Lee, D. Zhang, K.A. Kilian, S.H. Jung, T. Bretl, J. Xiao, M.J. Slepian, Y. Huang, J.-W. Jeong, J.A. Rogers, "Epidermal Mechano-Acoustic Sensing Electronics for Cardiovascular Diagnostics and Human-Machine Interfaces," Science Advances 2: e1601185 (2016). Z. Yan, F. Zhang, F. Liu, M. Han, D. Ou, Y. Liu, Q. Lin, X. Guo, H. Fu, Z. Xie, M. Gao, Y. Huang, J. Kim, Y. Qiu, K. Nan, J. Kim, P. Gutruf, H. Luo, A. Zhao, K.-C. Hwang, Y. Huang, Y. Zhang, J.A. Rogers, "Mechanical Assembly of Complex, 3D Mesostructures from Releasable Multilayers of Advanced Materials," Science Advances 2 : e1601014 (2016). C. Dagdeviren, P. Joe, O.L. Tuzman, K.-I. Park, K.J. Lee, Y. Shi, Y. Huang and J.A. Rogers, "Recent Progress in Flexible and Stretchable Piezoelectric Devices for Mechanical Energy Harvesting, Sensing and Actuation," Extreme Mechanics Letters 9, 269-281 (2016). K.-I. Jang, H.N. Jung, J.W. Lee, S. Xu, Y.H. Liu, Y. Ma, J.-W. Jeong, Y.M. Song, J. Kim, B.H. Kim, A. Banks, J.W. Kwak, Y. Yang, D. Shi, Z. Wei, X. Feng, U. Paik, Y. Huang, R. Ghaffari and J.A. 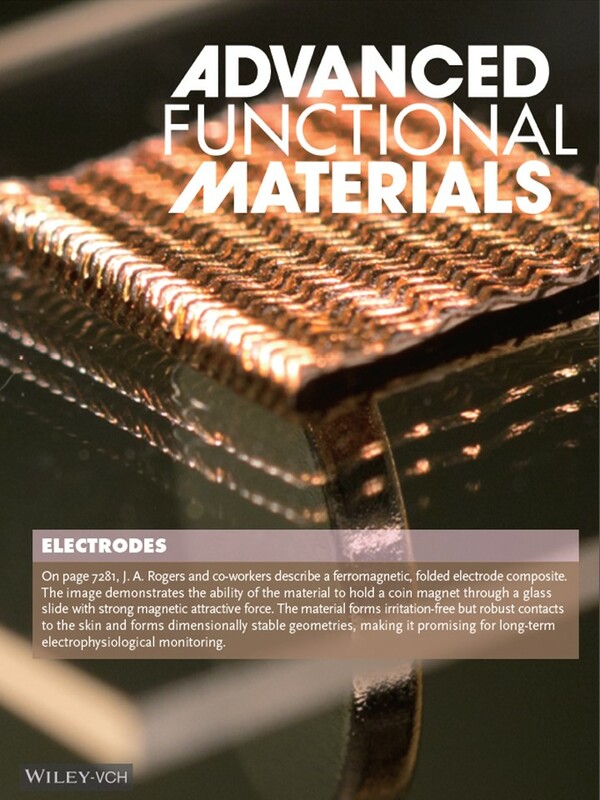 Rogers, "Ferromagnetic, Folded Electrode Composite as a Soft Interface to the Skin for Long-Term Electrophysiological Recording," Advanced Functional Materials 26, 7281-7290 (2016). H. Fang, J. Zhao, K.J. Yu, E. Song, A.B. Farimanic, C.-H. Chiang, X. Jin, Y. Xue, D. Xu, W. Dui, K.J. Seo, Y. Zhong, Z. Yang, S.M. Won, G. Fang, S.W. Choi, S. Chaudhuri, Y. Huang, M.A. Alam, J. Viventi, N.R. Aluru and J.A. Rogers, "Ultra-thin, Transferred Layers of Thermally Grown Silicon Dioxide as Biofluid Barriers for Bio-Integrated Flexible Electronic Systems," Proceedings of the National Academy of Sciences USA 113(42), 11682-11687 (2016). J. Rogers and J. Desimone, "Novel Materials," Proceedings of the National Academy of Sciences USA 113(42), 11667-11669 (2016). J.H. Yuan, M. Pharr, X. Feng, J.A. Rogers and Y. Huang, "Design of Stretchable Electronics Against Impact," Journal of Applied Mechanics (ASME Transactions) 83, 101009 (2016). J.H. Yuan, Y. Shi, M. Pharr, X. Feng, J.A. Rogers and Y. Huang, "A Mechanics Model for Sensors Imperfectly Bonded to the Skin for Determination of the Young's Moduli of Epidermis and Dermis," Journal of Applied Mechanics (ASME Transactions) 83, 084501 (2016). Y.J. Ma, Y.G. Xue, K.-I. Jang, X. Feng, J.A. Rogers and Y. Huang, "Wrinkling of a Stiff Film Bonded to a Pre-Strained, Compliant Substrate with Finite Thickness," Proceedings of the Royal Society A - Mathematical, Physical & Engineering Sciences 472, 20160339 (2016). Y. Ma, K.-I. Jang, L. Wang, H.N. Jung, J.W. Kwak, Y. Xue, H. Chen, Y. Yang, D. Shi, X. Feng, J.A. 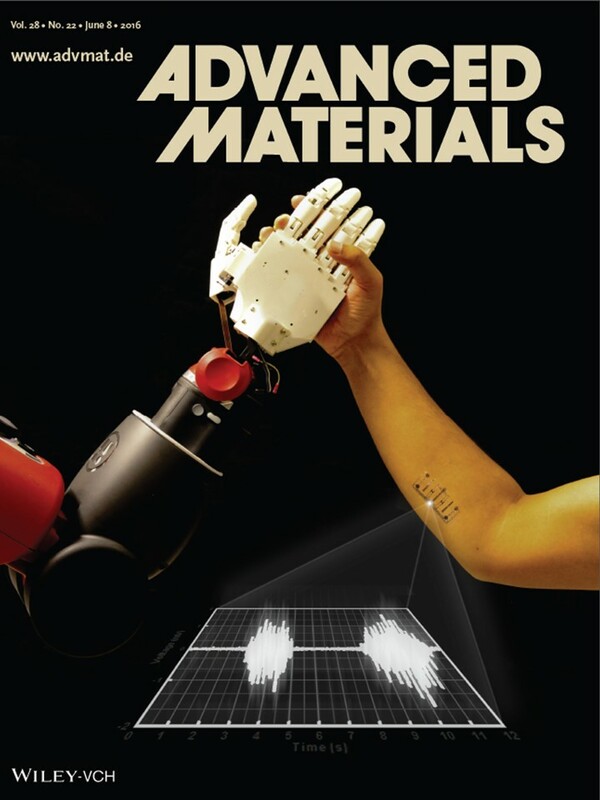 Rogers and Y. Huang, "Design of Strain-Limiting Substrate Materials for Stretchable and Flexible Electronics," Advanced Functional Materials 26, 5345-5351 (2016). J. Kim, G.A. Salvatore, H. Araki, A.M. Chiarelli, Z. Xie, A. Banks, X. Sheng, Y. Liu, J.W. Lee, K.-I. Jang, S.Y. Heo, K. Cho, H. Luo, B. Zimmerman, J. Kim, L. Yan, X. Feng, S. Xu, M. Fabiani, G. Gratton, Y. Huang, U. Paik and J.A. Rogers, "Battery-free, Stretchable Optoelectronic Systems for Wireless Optical Characterization of the Skin," Science Advances 2:e1600418 (2016). A.M. Abdullah, K. Nan, J.A. Rogers and K.J. Hsia, "Mismatch Strain Programmed Shape Transformation of Curved Bilayer-Flexible Support Assembly," Extreme Mechanics Letters 7, 34-41 (2016). J. Rogers and G. Balooch, "A Restorative Synthetic Skin," Nature Materials 15, 828-829 (2016). G. Constantinescu, J.-W. Jeong, X. Li, D.K. Scott, K.-I. Jang, H.-J. Chung, J.A. Rogers, J. Rieger, "Epidermal Electronics for Electromyography: An Application to Swallowing Therapy," Medical Engineering and Physics 38, 807-812 (2016). B.H. Kim, S. Nam, N. Oh, S.-Y. Cho, K.J. Yu, C.H. Lee, J. Zhang, K. Deshpande, P. Trefonas, J.-. Kim, J. Lee, J.H. Shin, Y. Yu, J.B. Lim, S.M. Won, Y.K. Cho, N.H. Kim, K.J. Seo, H. Lee, T.I. Kim, M. Shim and J.A. Rogers, "Multilayer Transfer Printing for Pixelated, Multicolor Quantum Dot Light-Emitting Diodes," ACS Nano 10, 4920-4925 (2016). J.W. Lee, R. Xu, S. Lee, K.-I. Jang, Y. Yang, A. Banks, K.J. Yu, J. Kim, S. Xu, S. Ma, S.W Jang, P. Won, Y. Li, B.H. Kim, J.Y. Cho, S. Huh, Y.H. Kwon, Y. Huang, U. Paik and J.A. Rogers, "Soft, Thin Skin-Mounted Power Management Systems and Their Use in Wireless Thermography," Proceedings of the National Academy of Sciences USA 113(22), 6131-6136 (2016). K.J. Yu, D. Kuzum, S.-W. Hwang, B.H. Kim, H. Juul, N.H. Kim, S.M. Won, K. Chiang, M. Trumpis, A.G. Richardson, H. Cheng, H. Fang, M. Thompson, H. Bink, D. Talos, K.J. Seo, H.N. Lee, S.-K. Kang, J.-H. Kim, J.Y. Lee, Y. Huang, F.E. Jensen, M.A. Dichter, T.H. Lucas, J. Viventi, B. Litt and J.A. Rogers, "Bioresorbable Silicon Electronics for Transient Spatiotemporal Mapping of Electrical Activity from the Cerebral Cortex," Nature Materials 15, 782-791 (2016). B. Xu, A. Akhtar, Y. Liu, H. Chen, W.-H. Yeo, S.I. Park, B. Boyce, H. Kim, J. Yu, H.-Y. Lai, S. Jung, Y. Zhou, J. Kim, S. Cho, Y. Huang, T. Bretl and J.A. 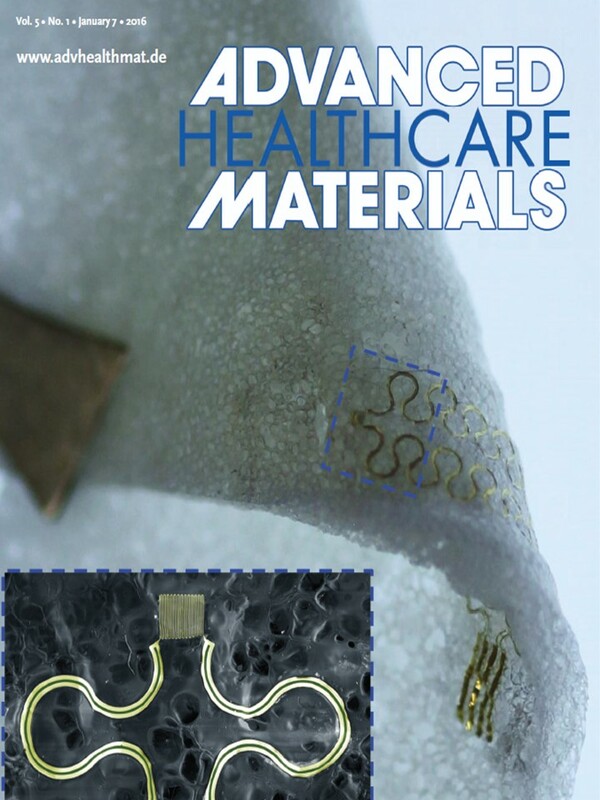 Rogers, "An Epidermal Stimulation and Sensing Platform for Sensorimotor Prosthetic Control, Management of Lower Back Exertion, and Electrical Muscle Activation," Advanced Materials 28, 4462-4471 (2016). S. Lee, B. Kang, H. Keum, N. Ahmed, J.A. Rogers, P.M. Ferreira, S. Kim and B. Min, "Heterogeneously Assembled Metamaterials and Metadevices via 3D Modular Transfer Printing," Scientific Reports 6:27621 | DOI: 10.1038/srep27621 (2016). Y. Liu, Z. Yan, Q. Lin, X. Guo, M. Han, K. Nan, K.-C. Hwang, Y. Huang, Y. Zhang and J.A. Rogers, "Guided Formation of 3D Helical Mesostructures by Mechanical Buckling: Analytical Modeling and Experimental Validation," Advanced Functional Materials 26, 2909-2918 (2016). Z. Yan, F. Zhang, J. Wang, F. Liu, X. Guo, K. Nan, Q. Lin, M. Gao, D. Xiao, Y. Shi, Y. Qiu, H. Luan, J.H. Kim, Y. Wang, H. Luo, M. Han, Y. Huang, Y. Zhang and J.A. 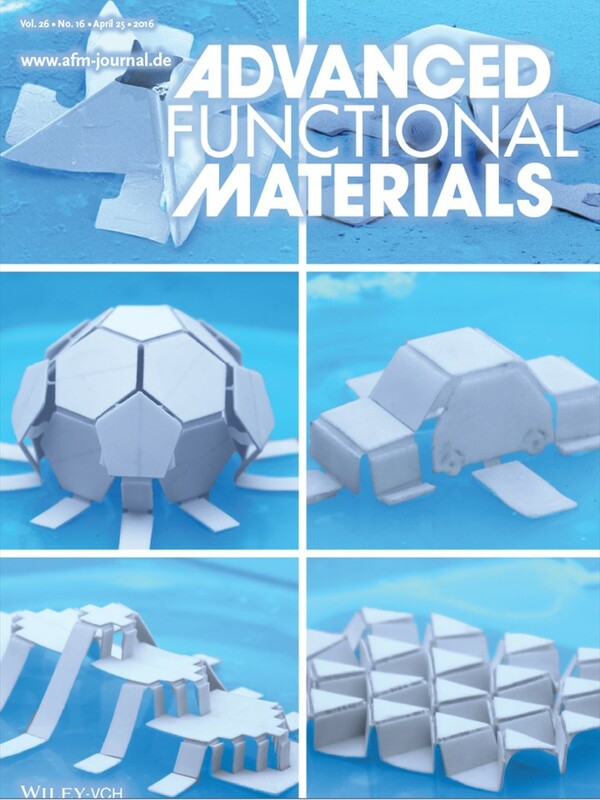 Rogers, "Controlled Mechanical Buckling for Origami-Inspired Construction of 3D Microstructures in Advanced Materials," Advanced Functional Materials 26, 2629-2639 (2016). S.-K. Kang, R.K.J. Murphy, S.-W. Hwang, S.M. Lee, D.V. Harburg, N.A. Krueger, J. Shin, P. Gamble, H. Cheng, S. Yu, Z. Liu, J.G. McCall, M. Stephen, H. Ying, J. Kim, G. Park, R.C. Webb, C.H. Lee, S. Chung, D.S. Wie, A.D. Gujar, B. Vemulapalli, A.H. Kim, K.-M. Lee, J. Cheng, Y. Huang, S.H. Lee, P.V. Braun, W.Z. Ray and J.A. Rogers, "Bioresorbable Silicon Electronic Sensors for the Brain," Nature 530, 71-76 (2016). Q. Ma, H. Cheng, K.-I. Jang, H. Luan, K.-C. Hwang, J.A. Rogers, Y. Huang and Y. Zhang, "A Nonlinear Mechanics Model of Bio-Inspired Hierarchical Lattice Materials Consisting of Horseshoe Microstructures," Journal of the Mechanics and Physics of Solids 90, 179-202 (2016). J. Rogers, Y. Huang, O.G. Schmidt and D.H. Gracias, "Origami MEMS and NEMS," MRS Bulletin 41, 123- 129 (2016). A. Koh, S.R. Gutbrod, J.D. Meyers, C. Lu, R.C. Webb, G. Shin, Y. Li, S.-K. Kang, Y. Huang, I.R. Efimov and J.A. 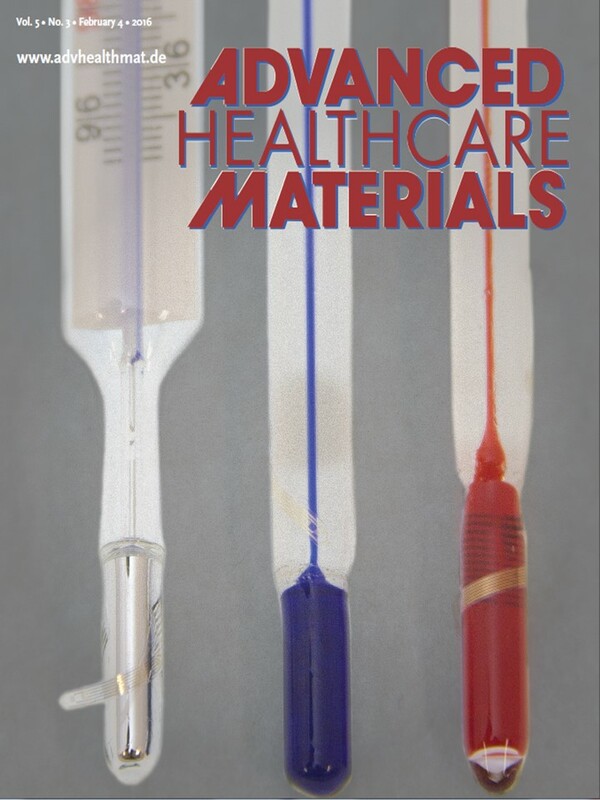 Rogers, "Ultrathin Injectable Sensors of Temperature, Thermal Conductivity, and Heat Capacity for Cardiac Ablation Monitoring," Advanced Healthcare Materials 5, 373-381 (2016). Y. Zhang, R.C. Webb, H. Luo, Y. Xue, J. Kurniawan, N.H. Cho, S. Krishnan, Y. Li, Y. Huang and J.A. Rogers, "Theoretical and Experimental Studies of Epidermal Heat Flux Sensors for Measurements of Core Body Temperature," Advanced Healthcare Materials 5, 119-127 (2016).